It’s time to get out our Kindergarten Easter centers. This year is going by so fast! Thankfully, by this point in the year, centers are running smoothly. Many of the activities I put in centers, are games we’ve already played this year. To give my students more practice with subtraction, I added this Easter game. It has subtraction math facts cards so students can play memory, matching, or use this board game for added fun. This also allows for differentiation. One of my Kindergarten Easter centers works on graphing. You could use this as a worksheet or in a page protector with dry erase markers. I do hold them accountable by making them fill out the response sheet about their graph after they finish. This Place Value Peeps game gives my students a lot of place value reinforcement. They clip the clothespin on the correct number, then flip it over to see if they got the right answer. I put a black dot behind the correct number. This is a simple worksheet where students break up the number into tens and ones. We’ve also been learning how to skip count by 5s and 10s so I made this simple ordering numbers game. I also added cards for skip counting by 2s to make this a bit more challenging. Students can use our 100s chart for help if needed. Here are some of the Kindergarten Easter centers I use during literacy time. Syllables always seem to be a hard skill for Kindergarteners to get. This Easter Syllables game gives them a bit more practice clapping out the syllables in each picture. This next activity helps my students work on the middle sound they hear in the word. They simply cut and glue the pictures to the cup that matches the middle vowel sound in the word. I made 5 different versions so they can get a lot of practice on short vowels. Great fine motor practice too! We are needing more practice on word families, so I use this Egg-celent Word Families game in my literacy centers. My high students use the cards with 3 letter word families, while my lower students use the 2 letter word family cards. You can find my Kindergarten Easter centers in my TPT store. To make our room festive for Easter, we create these small bunny baskets. I give students the chance to bring in something small for their classmates. These Easter baskets are super easy to make: you just need a few plates, construction paper, and Easter grass! My students get to choose what colors they want to use for their grass and bunny ears/nose. 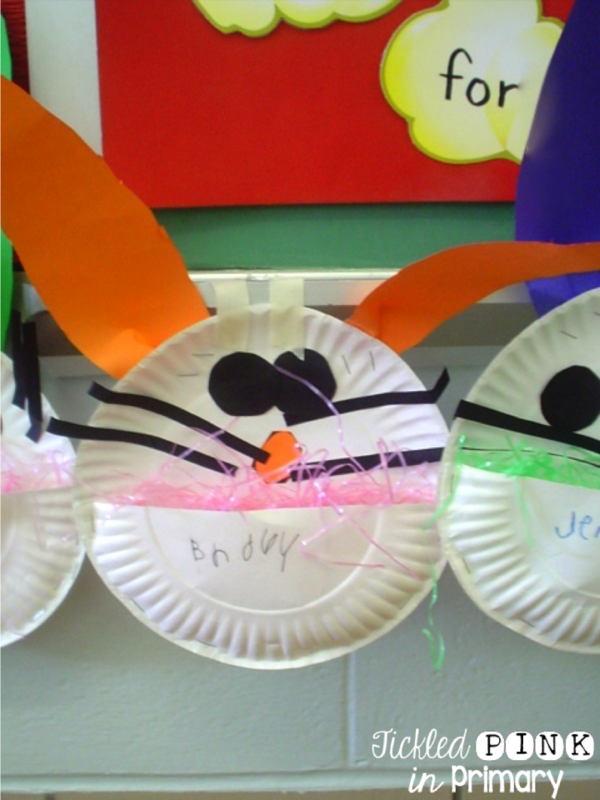 Another easy craft are these “peek-a-boo” bunnies, and they are always a hit in my class! I give my students 2 ovals and have them decorate one any way they want. Then, they make a bunny face on the second oval. Students then cut the egg in half. I go around and assemble the egg on top of the bunny face with metal brads as they are working. Don’t forget to check out my (editable) Easter Fluency & Fitness to get your kids up and moving while learning, or my Easter Fluency Find It to get your students working in teams.